More ore less a year ago I did my first experiments with the fish-eye inside a lavender field. 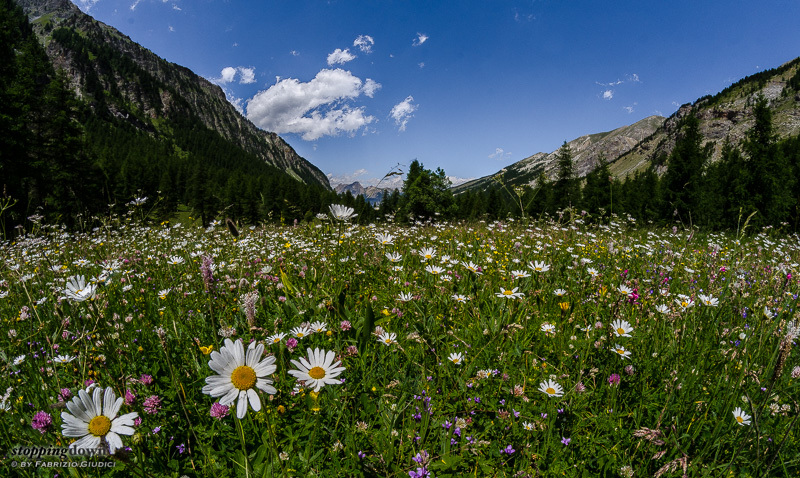 A week ago I had the chance of being in the Alps along the french-italian border and I could try the fish-eye with a couple of alpine meadows. The first relevant difference is the size of the plants: a lavender plant is relatively large and you don't need to shoot at ground level (unless you want some creative option such as pointing at the sky). 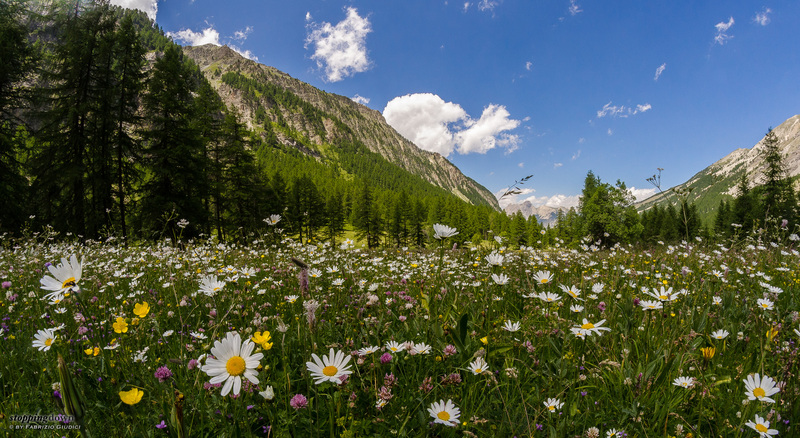 Alpine flowers are mostly short and so the camera must be placed just at a few centimetres above the ground; this means that you have to lay down. A good advice is to do first some safety check, such as making sure that there are no snakes or anthills around. Nikon D7000 + Samyang 8mm ƒ/3.5 @ 8 mm, 1/100 sec @ ƒ/16, -1.67 EV, ISO 100, hand-held. Another difference to lavender fields: alpine meadows tend to be chaotic and filled with flowers of different species. On one side you can take advantage of the effect of multiple colours, on the other you need to avoid distracting objects. With a fish-eye you get so much stuff in the frame that manually pruning a few unwanted things won't work. Instead, moving the camera by a few centimetres can achieve dramatic changes in the image - the point is to have some interesting stuff popping out in the foreground. Also, things in the foreground need to be sharp - the minimum focusing distance of the Samyang fish-eye is 30cm, which means that things should be reasonably sharp starting from 15cm. You should try to avoid objects closer than that distance, a thing that I wasn't able to properly control in the above shot. I also had a problem with motion blur, as a strong wind was moving everything around and my shutter wasn't that fast. Exposure in this kind of shot is mainly done by trial and error: in spite of the very good light meter in the Nikon D7000, I had to dial -1 1/3 EV to have a good histogram (and anyway highlights needed some correction in post-processing to avoid burning the whites in the clouds). Floraison des marguerites dans le Vallon du Mélezet. Nikon D7000 + Samyang 8mm ƒ/3.5 @ 8 mm, 1/200 sec @ ƒ/16, -1.67 EV, ISO 500, hand-held. 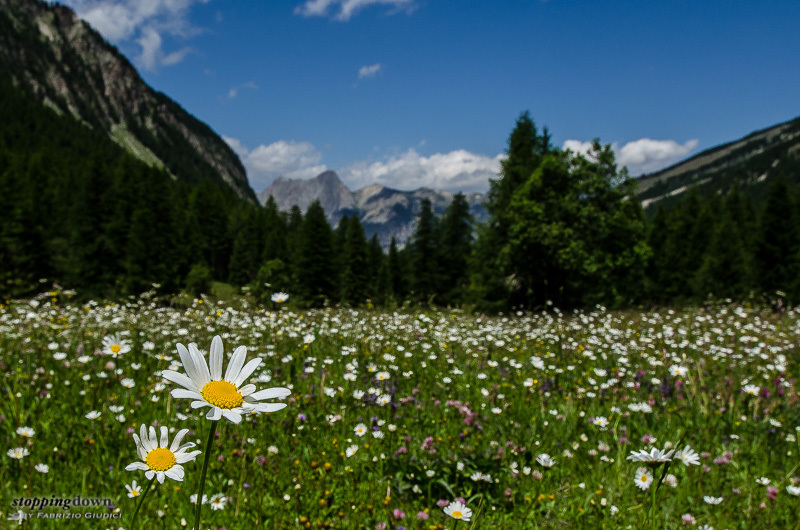 The second day I found another meadow, mostly filled with daisies. The wind was still strong and made the clouds travel very fast, changing the light in the scenario every few seconds; but the air near the ground was almost quiet, making my job a bit easier than the previous day, even though the taller flowers were still occasionally moving. 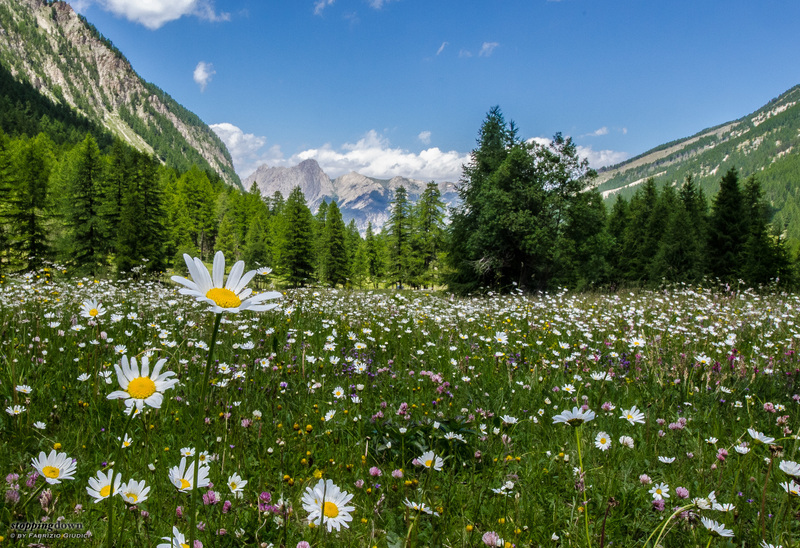 I walked through the meadow searching for some daisy that was standing out, possibly leaning a bit toward me. Laying down on the ground in a horizontal attitude made very difficult to me to have a level horizon, even though I was helped by the framing hints in the viewfinder - but I needed to do some moderate correction in post-processing. An insect on the leftmost daisy added a bonus to the shot; there were also some butterflies around, but none decided to land while I was shooting. Too bad. I wrote a mental note for the future: this kind of shooting needs plenty of time. Nikon D7000 + Samyang 8mm ƒ/3.5 @ 8 mm, 1/200 sec @ ƒ/16, -1.67 EV, ISO 125, hand-held. Light was dramatically changing because of the moving clouds. It sometimes created a strong contrast in the green shades of the trees placed at different distances, so I shot several dozens of shots in order to have a good deal of variations to pick from (this also helped to pick the best flower placement, as they were moving a bit because of the breeze). The correct exposure was granted by setting the auto ISO, so I could keep the desired aperture and shutter speed all the time. 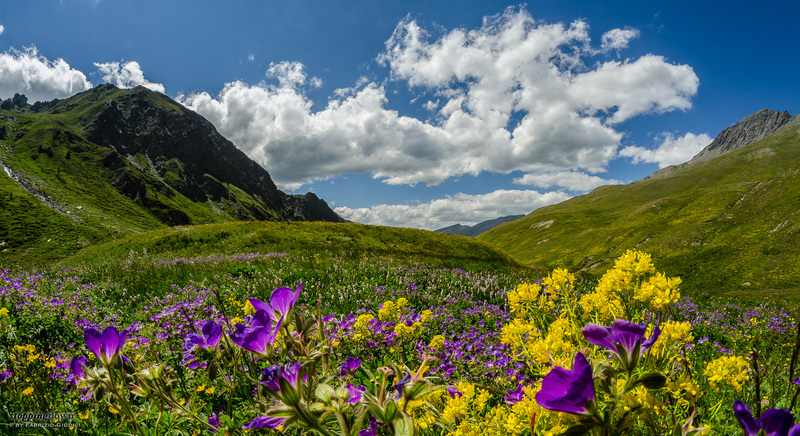 In some cases I applied a selective lightness reduction for greens, in order to have the flowers better popping out of the meadow. I also did some shots with a “regular” wide-angle, the 12-24mm. This alternate approach made it possible to have more details of the landscape in background (the fish-eye pushes it very far away), but losing most of the immersive effect of the fish-eye. Also, note that in spite of ƒ/22 the background is not very sharp. This problem could be solved with the hyperfocal technique, but unfortunately modern, auto-focusing lenses such as my wide-angle don't carry the needed barrel markings any longer. With the fish-eye there's no such problem as it sports a huge depth-of-field even when focusing at the closer distance. Nikon D7000 + Nikkor 12-24mm ƒ/4G DX AF-S @ 19 mm, 1/160 sec @ ƒ/22, ISO 1250, hand-held. At last, I tried with a wider aperture and focusing on the daisy, getting the background out of focus. This approach could be effective with a foreground subject more interesting than just a couple of daisies: a larger flower and perhaps a butterfly on it. For my experience so far, it could be the only case in which the 12-24mm can be useful for this kind of subjects: otherwise the fish-eye seems a much better choice. Nikon D7000 + Nikkor 12-24mm ƒ/4G DX AF-S @ 19 mm, 1/400 sec @ ƒ/16, -1.00 EV, ISO 180, hand-held.